We specialize in Whiting truck door parts and Todco truck door parts. Whatever your need, we are confident you will find quality replacement parts to repair your box truck door. Please feel free to call or e-mail us for all of your truck door needs. We are a professional garage door installation and repair company. We carry many repair parts for many different brands of doors, and if we don’t have it in stock, we can usually get it in a few days. If you are looking for a part and we don’t have it listed, just email us and we’ll quote a price. 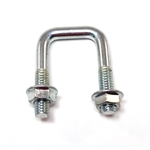 Box Truck Door Rivets measure 3/4" across the head and 1 1/4" in length overall. Overall length of bolt is 1.75". Overall width of bolt is 1.50". Includes 2 each 5/16" flanged nuts. Whiting Style Box Truck Door Roller, 2"
Whiting Style Box Truck Door Nylon Roller, 2"
Elevator bolts measure 15/16" across the flat head and 1 1/4" in length overall.